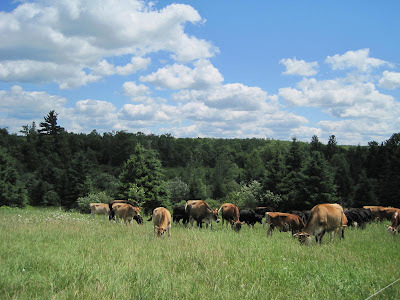 The cattle enjoy this diverse pasture at the back of our farm with its tasty brambles, birdsfoot trefoil, wild mints and shady spruce grove. 80 Acres of organic pastures managed by pigs, cattle, chickens, sheep, and two farmers devoted to their care. Managing the pasture as an ecosystem through the controlled rotation of animals across the landscape.